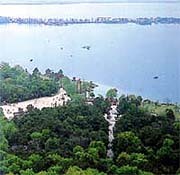 Situated in east suburb of Wuchang, the East Lake Scenic Spot occupies 78 sq. km with 33 sq. km covered by water.Along the west bank are Shuiyunxiang Building, Tingtaoxuan Pavilion, Xingyin Tower, Binhu Corridor, Qu Yuan Memorial Hall, Tianchang Tower and Lu Xun Square. Other places such as the pear and orange orchards, bamboo forest and lotus pool are dotted among the arms, adding more charms to the East Lake.